A surgical procedure performed to push a paralyzed, atrophied, or scarred vocal cord toward the other vocal cord and reduce flaccidity. A medialization laryngoplasty is typically performed under sedation and local (not general) anesthesia, on an outpatient basis. 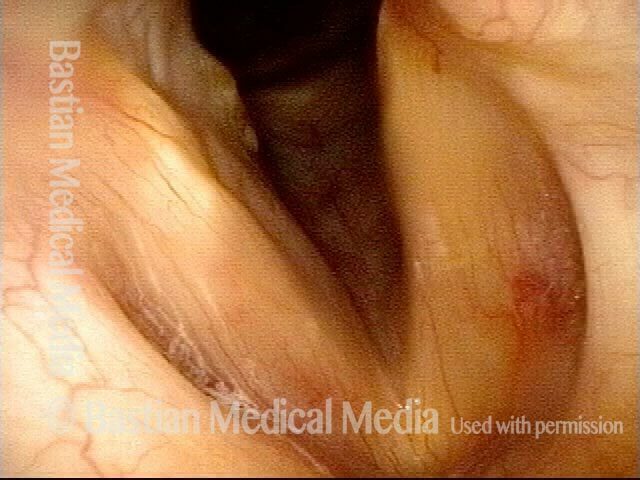 TA + LCA paresis of the left vocal cord (right of photo). Vocal cords in breathing position. The evidence of TA muscle weakness includes: convex margin; capacious ventricle; prominence of vocal process; and “sphaghetti-linguini” difference between the cords. It appears that the PCA muscle is working, as the left cord is quite lateralized. The LCA muscle is not fully evaluated until the patient phonates (next photo). Phonation. Notice the lateral buckling of the membranous cord, indicative of TA weakness. In addition, notice the lateral turning of the vocal process (arrow), indicative of LCA weakness. For more on observing LCA weakness, see also our LCA-only paresis entry. Two weeks after medialization of the left vocal cord (right of photo). There is expected inflammation and resolving bruising. The vocal cord is appropriately filled out. Voice is already dramatically improved. Phonation. This view shows marked reduction of the gap, explaining why the voice is now strong, and no longer breathy. A few months later. 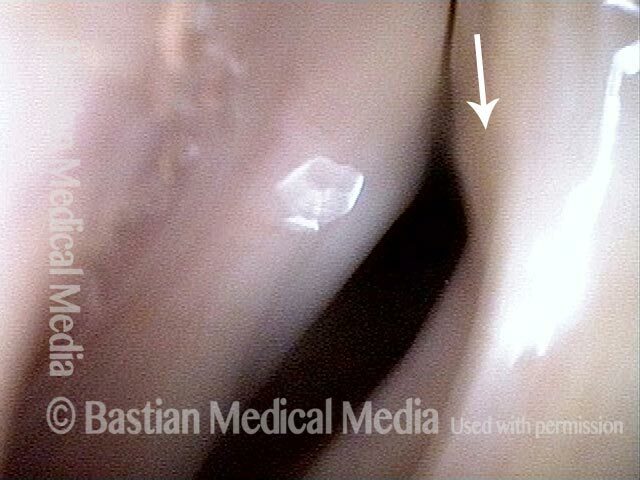 The implanted left vocal cord (right of image) remains plumped up, and is at the midline. The right cord abducts normally. Phonation, under strobe light. There is good vocal cord approximation, which explains the patient's much improved voice. Note that the view here and in photo 7 is rotated at least 30 degrees counter-clockwise relative to photo 5 (see the false cord line, for reference), possibly giving the illusion that the implanted, paretic cord (right of image) is moving to close the gap, when in the fact the opposite cord is. Phonation, open phase of vibration, under strobe light. This view shows that the implanted cord has better bulk and firmness than the un-implanted cord. Mucosal wave is greater in the un-implanted cord. Occasionally, a mobile but somewhat flaccid cord, such as seen here, if associated with weak voice leads to placement of a second implant into the mobile cord. In this case, the patient is content with his voice. A classic example of “spaghetti-linguine” vocal cords, here in breathing position. The “linguine” cord (left of image) is normal; the “spaghetti” cord (right of image) is paralyzed, likely since birth. On the paralyzed side, notice the deep and broad ventricle, mild bowing of the margin of the cord, and reduced width of the upper surface of the cord (“spaghetti”-like), as compared with the non-paralyzed side. Phonation, more distant view, under standard light. Notice the considerable gap between the vocal cords. This gap correlates with the patient’s weak and air-wasting voice quality. Open phase of vibration, under strobe light. The paralyzed cord (right of image) has a much increased amplitude (lateral or outward excursion) and exaggerated bowing, due to its flaccidity. “Closed” phase of vibration, which is of course not closed at all, because the paralyzed cord (right of image) cannot come fully to the midline. One week after surgical medialization of the paralyzed cord (right of image), using a silastic implant buried deeply within the cord. Notice that the ventricle is no longer capacious, and the free margin is no longer bowed. Furthermore, in contrast with photo 1 of this series, the “spaghetti-linguine” description of these vocal cords is no longer apt. Phonation, under standard light. The gap between the cords is no longer seen (compare with photo 2), and the patient's spontaneous speaking voice sounds normal. She can recruit loudness effectively without any luffing or observable weakness. Open phase of vibration, under strobe light. The lateral or outward excursion of the paralyzed cord (right of image) is now similar to that of the non-paralyzed cord. Compare with photo 3. The closed phase of vibration is much more closed than preoperatively. Compare with photo 4. Five months after medialization. Compare this partially abducted position with photos 1 and 5 of this series. Phonation, under standard light, showing vibratory blur. Compare with photos 2 and 6 of this series. Open phase of vibration, under strobe light. As in photo 7 of this series, and in contrast to photo 3, the implant does not permit the paralyzed cord (right of image) to “buckle” laterally, or outward. If anything, the vibratory excursion of the non-paralyzed (and un-implanted) cord is greater than that of the paralyzed, implanted cord. The closed phase of vibration is now virtually normal, similar to photo 8 and in contrast with photo 4. 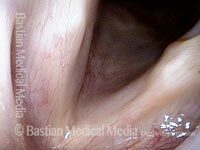 Right vocal cord (left of photo) paralysis. During breathing as shown here, the right cord (left of photo) is paramedian, while the left cord (right of photo) is widely abducted. Note also the bowing (curvature) of the right cord (left of photo), and the prominent ventricle, both of which are indications of atrophy/ reduced bulk of the muscle within that cord. Phonation, with vibratory blurring under standard light. Right cord (left of photo) remains paramedian, and the left cord (right of photo) has swung to the midline. Even so, large gap between the cords shows that closure is incomplete, and this explains the weak, air-wasting voice; the patient can only say a few words before running out of air and having to take another breath. After medialization and placement of a silastic implant, the right cord (left of photo) is less atrophied and the bowing much diminished. The cord has also been shifted slightly to the midline. Phonation, again with vibratory blurring, but notice the much better approximation of the cords. The voice is stronger, and less air-wasting. See an example of one variant of vocal cord paresis and how it limits the voice. Then watch a medialization procedure in which voice gel is injected into the vocal cord affected by paresis, and hear how the voice thereafter improves. This entry was posted in Multimedia Encyclopedia and tagged Audio, Photos, Treatment, Videos, Voice & other larynx disorders by admin. Bookmark the permalink.